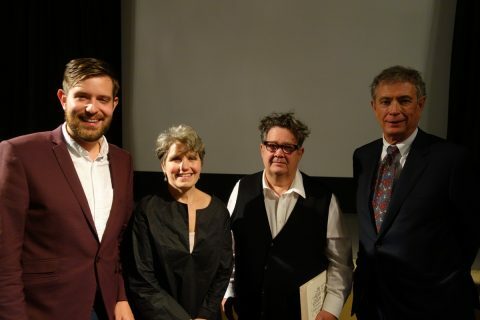 On October 2, the Alcuin Society held their annual ceremony honouring the winners of the 2016 Alcuin Society Awards for Excellence in Book Design in Canada. 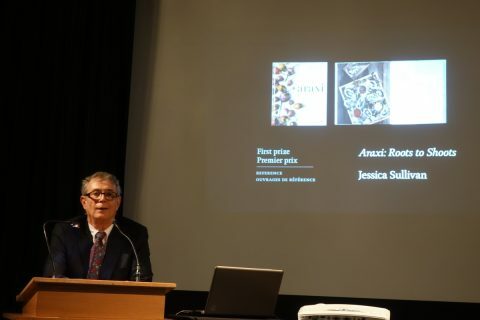 The evening took place at the Arts and Letters Club of Toronto, and featured not only the lovely award-winning books, but also a talk by celebrated illustrator and book designer, Frank Viva. DA’s Don McLeod was on hand to take some photos. 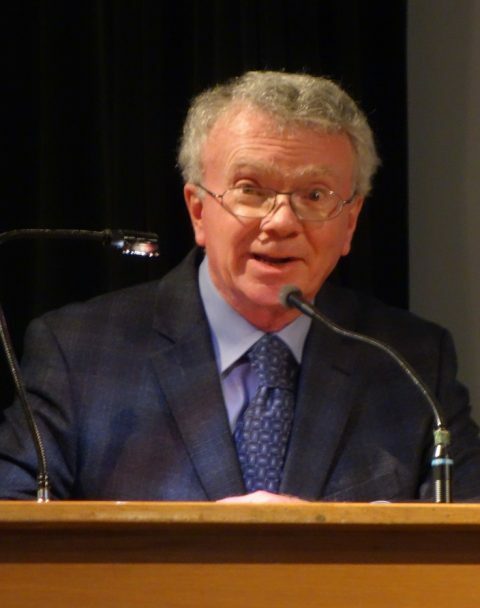 David Phillips, president of the Arts and Letters Club of Toronto, greets attendees at the Alcuin awards evening. 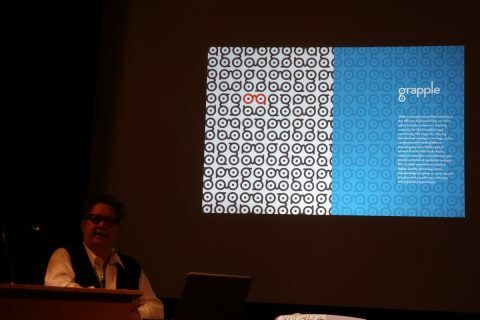 Designer and illustrator Frank Viva gave the keynote speech. 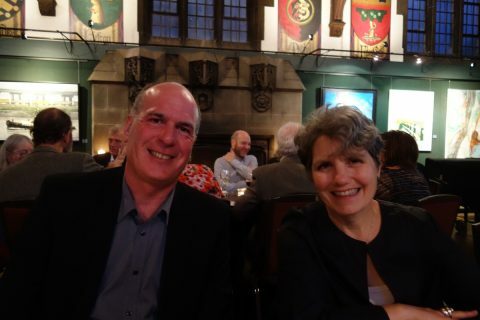 Book designers Peter Ross and Linda Gustafson of Counterpunch Inc.
Grant Hurley, Linda Gustafson, Frank Viva, and Chester Gryski at the Alcuin awards evening. 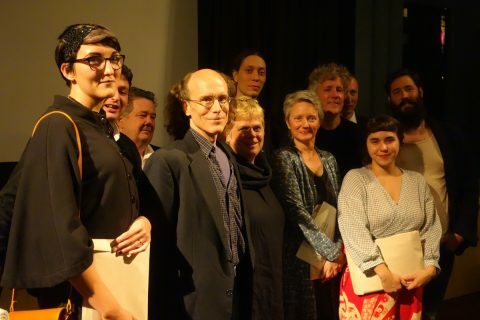 A smiling group: Kate Hargreaves, Benoȋt Tardif, Frank Viva, Chester Brown, Beth Oberholtzer, Anouk Pennel, Marlene MacCallum, Daniel Canty, Branden Douglas, Esmé Shapiro, Raphaël Daudelin. EDIT: An earlier version of this post incorrectly reported the names in the final image, confusing Pennel and Daudelin. Our apologies for the mix-up! A huge congratulations to all! 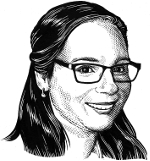 Be sure to check out the full list of Alcuin Award winners and browse the lovely designs. This entry was posted in Events, Photos and tagged Alcuin Society, Alcuin Society Awards for Excellence in Book Design, Arts and Letters Club, awards, bood design, Events. Bookmark the permalink.